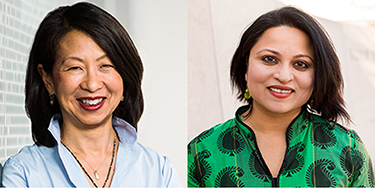 AALDEF will present its 2017 Justice in Action Awards to Marie Oh Huber, Senior VP Legal Affairs, General Counsel, and Secretary of eBay Inc., and Deepa Iyer, civil rights activist and attorney, on Thursday, March 2, 2017. The awards will be presented by Sandra Leung and Linda Sarsour, and the emcees will be Cindy Hsu, CBS 2 and WLNY 10/55 anchor and reporter, and Sree Sreenivasan, chief digital officer of New York City. The event will take place at PIER SIXTY, Chelsea Piers, in New York City. The evening begins with a 6 pm reception, followed by dinner at 7 pm and the Justice in Action awards ceremony. For more information or to purchase tickets, email events@aaldef.org or call 212.966.5932.